This presentation is best explained by Dr. Viehweger's article on Global Scaling. Keep in mind, the article may be health focused, but the applications are limitless such as communication, energy, or other systems. The spectrum of the standing wave system on its lowest energy level is a logarithmic one. It is fractal and hyperbolic. Scaling is a basic property of fractal processes. The logarithm is the natural logarithm e, discovered by Leonhard Euler. In the spectrum we find places with constant changes, where matter, energy or information get compressed or decompressed. The spectrum is, in every dimension, self similar and it has gaps, where there is nothing. To transfer such a standing wave system into our visible world, it must be calibrated with the natural oscillation of the proton. Why? The natural oscillation of the proton is the most stable existing vibration in the universe. It is always there, for eternity. We can say so, because the life time of a proton is at least 1032 years. The electron is the second one, which is living for a very long time, but it is 1836 times lighter than the proton, so – on the lowest energy level - it is always moving, how the proton is leading it. Now it is possible to look, how structures or patterns as the phenotype of the universe, we find in our visible material world in space and time, are related to the genotype of our universe via the resonance to the natural oscillations of the proton. 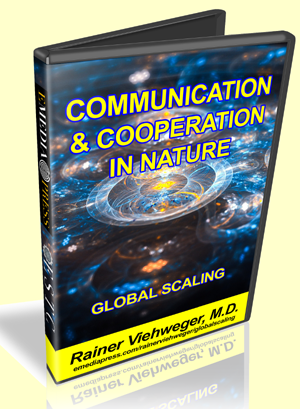 This is the most important thing in the understanding and the practical usage of Global Scaling for our everyday life but also it is of fundamental importance for creating new knowledge in the today ´s scientific world to prepare for today ´s and tomorrow ´s needs.